This review marks my completion of the four novels that comprise this year’s The New Face of Fiction and, for this reader, it has been a wonderful experience. And, for those who have followed the reviews, stay tuned. One of the objectives of this blog is to provide a forum for Canadian fiction writers to the rest of the world (and I know the world is interested) so this chance to introduce new Canadian voices is much appreciated. Thanks to the generosity of Random House Canada, and with a bump from KfC, the blog will be announcing tomorrow two giveaway contests that will give you the chance to win your pick of the four. 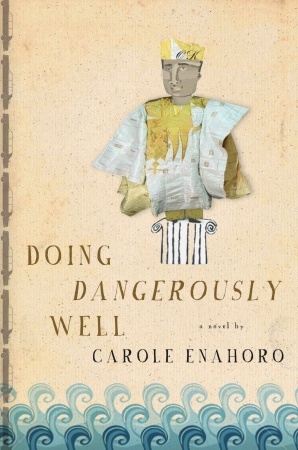 Carole Enahoro’s Doing Dangerously Well joins a relatively short, but impressive, list of fiction that links the experience of Nigeria and its people with First World economics. Ben Okri’s The Famished Road was, for me at least, first into the lists, a compelling, but difficult, exploration that never left Nigeria — but spoke enough to Western tastes that it won the 1991 Booker Prize. Chimamanda Ngozi Adichie followed with Half of a Yellow Sun, the 2007 Orange Prize winner, and her 2009 short story collection — The Thing Around Your Neck — which has attracted a positive critical response. Carole Enahoro, who was born in London of a Nigerian father and is now a resident of Nigeria, Britain and Canada, adds her contribution to the list with this novel. Doing Dangerously Well verges on being polemical (not a favorite trait for me, I’ll admit, but this novel overcomes that objection) and it is worth knowing that before picking it up. The story begins with the collapse of Kainji Dam. The dam is real, built in the 1960s and one of the longest in the world, but it has not collapsed (although that may be imminent) — Enahoro uses that speculation to frame her story of conflict. As it moves on, the novel contemplates what manipulative forces would be put into play — historical, economic, political and, perhaps most important, opportunistic — when such a disaster might occur. Those who are following the Gulf of Mexico-BP story may well find some metaphorical messages in this book. The first character the author introduces — Amos — will survive only a few pages. He is a charismatic figure (“striding like a panther”), who has made good (“from his snakeskin boots to his sheepskin jacket, all was as it should be”), and he has returned to his native village of Ndadu to acknowledge both his family heritage and his ancestral history. In the midst of the celebration of his return, the dam bursts and Amos, not to mention Ndadu, is swept away. So are hundreds of thousands of Nigerians who live downstream from the dam. Enahoro has framed her story at this point. The elements that will come into play for the rest of the book need to be introduced and it does require some patience from the reader for her to put them in place. Two days after the disaster, a white Mercedes-Benz pulled up outside the house of General Abucha, the head of Nigerian armed forces. Out stepped the short, plump form of Ogbo Kolo, enfolded in a gold agbada. He immediately opened his Chinese parasol for the twenty-yard trip to the front door. There, he waited for his driver to press the bell. After this formality, he handed his driver the parasol and exchanged it for his briefcase. They both stood at attention and looked straight ahead at the door. The disaster will promote Kolo into the presidency — if it hadn’t been this, it would have been something else. He has been riding a lucrative wave of corruption as a cabinet minister; that wave can only get more tsunami-like now that he controls the government. She spotted panic in Mary’s bat-like eyes — as the elder sister, perfection was Mary’s watchword, and anything less could destroy her. A wash of empathy swept trough Barbara: her sister was only adopting the role the family demanded of her. Even she expected this unwittingly female creature, placed at a precarious height, to represent the family’s ideals. If Mary fell, Barbara would feel the bruise just as keenly. Here was one of the great orators in Nigeria, who could make the ears and eyes of even his most radical opponents prick up like an antelope’s. Femi possessed wit and style, backed by strong legal training, and so could make pounded yam out of the most logical argument. Added to this, his exchanges had an air of theatricality about them, his greatest prop being his ever-present agbada — a voluminous tunic that expanded his physical presence and gave weight to his authority — though certainly no item was too minor to employ. Those are the elements of Doing Dangerously Well. Does it work? I would have to say “a definite maybe”, but that may be a reflection of both my age and my experience. It is definitely a “story” novel, where the plot and people are much more important than the style. I do think that it is an entirely worthwhile first effort and will be very interested in whatever direction the author chooses to go in her next work.